WASHINGTON — With Bell Helicopters’ V-280 Valor and Sikorsky-Boeing’s SB-1 Defiant nearly ready for prime time, the Army’s Advanced Vertical Takeoff and Landing effort could see flying demonstrations of a vertical lift helicopter as early as next year. But while progress has been steady, thoughtful management and changes around the acquisitions process could make it go even faster, Army representatives and an executive from Bell Helicopter said in a roundtable that was hosted by Defense News at the Association of the U.S. Army annual convention. Roundtable participants together painted an optimistic picture of the state of vertical lift. “The beauty is that we are very close to being right where we expected to be when we started this five-plus years ago,” said Vince Tobin, executive vice president for military business with Bell Helicopter. Bell was the underwriter of the roundtable. 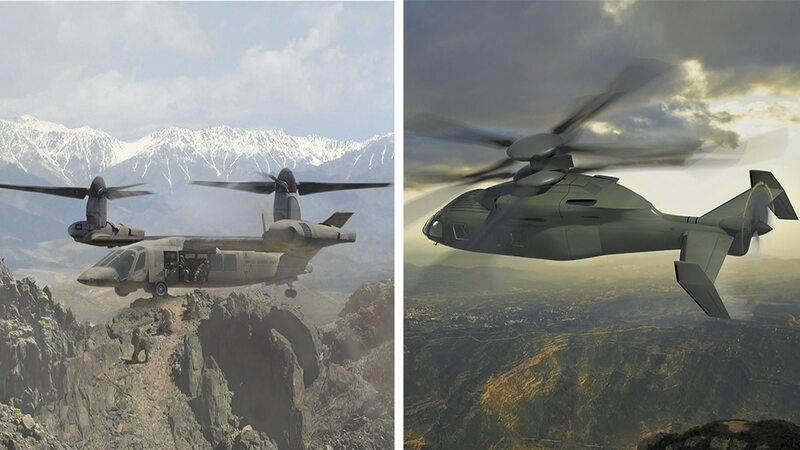 The Army has been planning for two vertical lift aircraft to begin flight demonstrations in the fall of 2017 critical to the process of informing and shaping the design of a Future Vertical Lift helicopter fleet expected to come online in the 2030s. But one of the demonstrators – the Sikorsky-Boeing-made SB-1 Defiant coaxial helicopter – is now slated to start flying at some time in the first half of 2018, behind the original schedule. The Army has locked down a range of detailed specs for the future aircraft, “everything from how much somebody weighs inside the aircraft [to] how big the seat has to be to accommodate not only the person, but the exoskeleton they’ll be wearing,” said Bill Lewis, the director of the aviation development directorate at the U.S. Army Aviation and Missile Research Development and Engineering Center. The Army also has asked the vendor community for a faster product, something that could fly twice the speed of a conventional helicopter. “We really pressed configurations for speed. That was the main attribute,” Lewis said. A two-year demonstration period lies ahead for the emerging aircraft, during which time the Army will work to ensure mission systems can be seamlessly integrated into the new platform. The service is leveraging the advanced architectural design language to hasten that process. With advanced software techniques speeding systems integration, planners are looking at other ways to accelerate both components of the new platform and the whole vertical lift program. Consistent funding would help – “not just a lot of money, but stable and predictable funding,” said Col. Roger Kuykendall, improved turbine engine program and future vertical lift program manager with the Army. He’s also looking at a range of variables that could impact the timeline, including the specific program requirements, the level of technology in play and the amount of required testing. Bob Sheibley is at the helm of both efforts as acting Army project manager for Future Vertical Lift and the Improved Turbine Engine Program. “All that equates to time and money as well. So, I think there are ways to accelerate that, especially with an emphasis from senior leadership. I think those all contribute to accelerating the program,” he said. Lewis proposes taking things a step further, removing or reducing broad swaths of the conventional process in order to tailor-make an acquisition defined by the needs of the program. In the meantime, the Army says it remains committed to supporting its current helicopter fleet while it waits for the vertical lift effort to come to fruition.